During our first week of the trip, which was spent in Phuket, we attended a cooking class at the next town over, Kata Beach. I had signed us up nice and early with it being high season, and the class having stellar reviews on Trip Advisor. Much to our surprise, when the driver showed up we were the only two attending class that day. Nice. 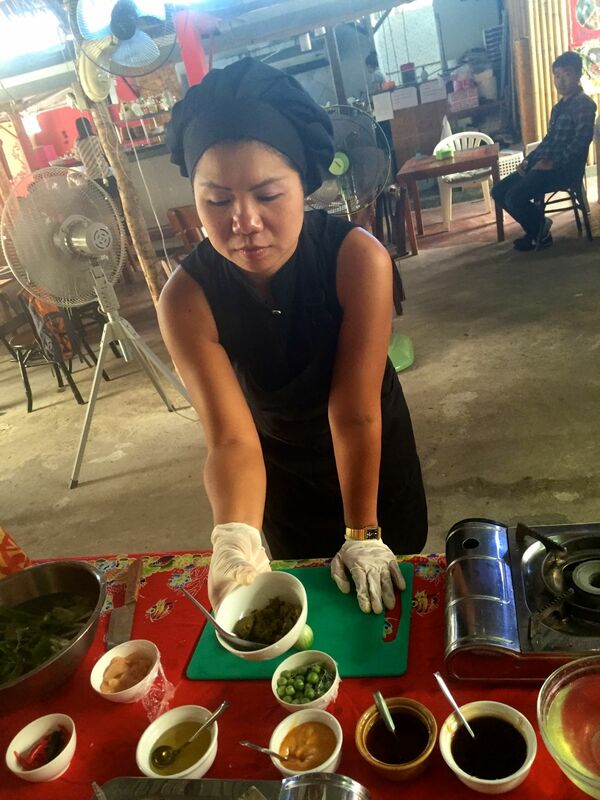 Our instructor, Mimi, and driver transported us from our resort to The Kitchen, a Thai restaurant and cooking class venue, with one stop at a market along the way. It was the type of day in Phuket that edged on unbearably hot, for a canuck like me… well over 30 degrees and disgustingly humid (and this was dry season). Mimi took us to a large nearby open-air market (thankfully with shade), to give us an example of how fresh produce and meat are sourced for the plethora of Thai restaurants in that area. We sauntered around while she gave us explanations on mostly vegetables, and meat, and we asked some questions. We could have easily walked around for an hour, just looking, but we were eager to get to the class, where the ingredients had already been purchased and prepped for us. We were treated to as much bottled water as we wanted, and after we arrived, had a few minutes to rest in the wind of a two large fans; I started to cool off. Our setup was a humble folding table with a plastic tablecloth, single gas burners, plastic cutting boards and the necessary knives, utensils and pots and pans. 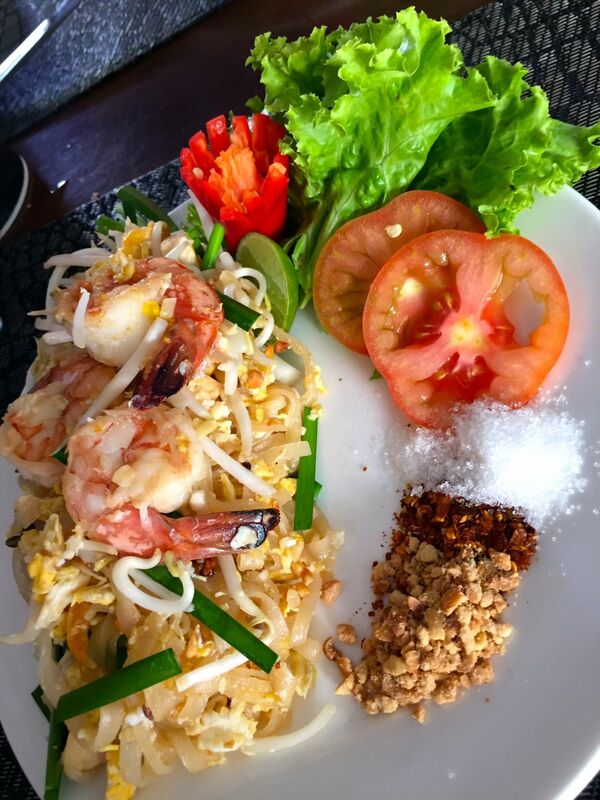 We were learning four Thai dishes, which we picked in advance on the website: vegetable spring rolls, gang keaw waan tai (green chicken curry), traditional pad thai with prawns and tom yum goong (pictured at the very top). 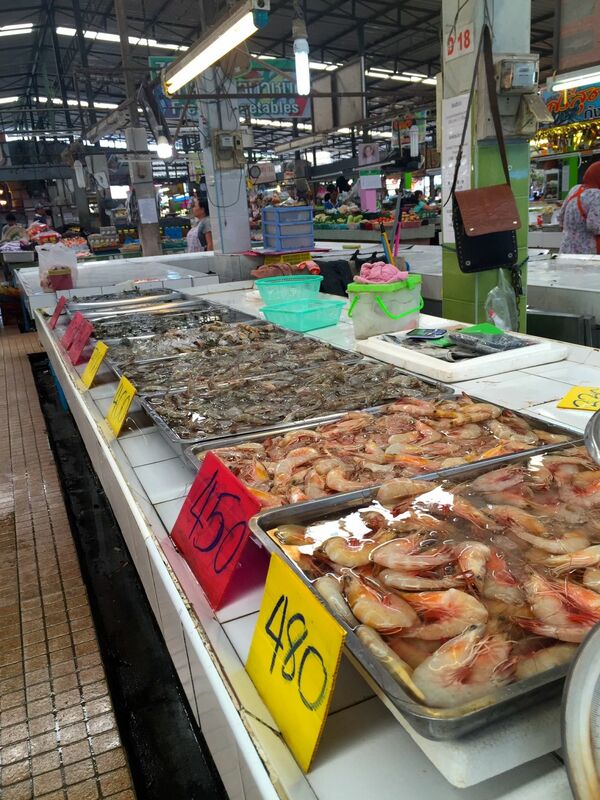 So, very recognizable Thai dishes that we thought would be fun to cook while in Thailand! The methods were a little less complicated than we were hoping for (especially for Geir), as in, we used some short cuts like pre-made green curry paste. But overall it was a great experience and Mimi was super fun and friendly. Finished pad thai, served with crushed peanuts, chiles and sugar as is customary here. All of the dishes turned out flavourful and tasty, with the curry and the pad thai having a very healthy amount of heat! We found the recipes used a surprising amount of sugar, and that a lot of Thai dishes include either white or brown sugar to balance out the spicy chiles. We got to take a copy of the recipes home. Check out the photo gallery for the market tour and cooking class, and below that — a recipe for green curry chicken! Fresh vegetables at the market. Here I was thinking baby corn came out of a can. Mimi didn’t know the English word for this herb/plant, but it smelled great. The setup for our cooking class. Just the two of us in attendance! My spring rolls, ready to be deep fried. A photo they might use on the website! About to make pad thai. Our curry, it was quite spicy. Our ingredients for pad thai. Our fourth and last dish we learned — tom yum goong. A mild, sweet and sour type of soup. “I’m too sweaty to be in photos.” We cooked on a ridiculously hot day. 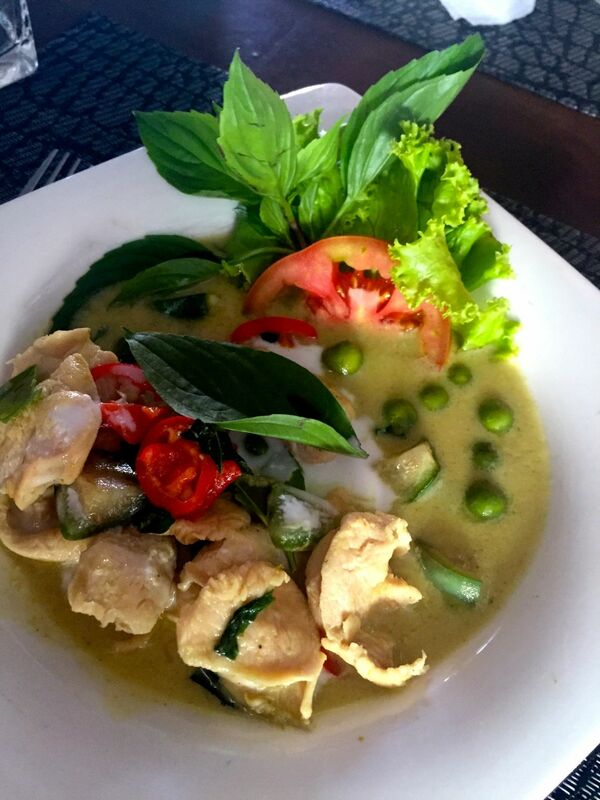 Below is the green curry chicken recipe we were sent home with, which is very fast and easy to make. The measurements are a bit different, and the yield is not listed, but I’d guess two servings. You can’t get the type of small eggplant that we used here, usually, so substitute for any vegetable you enjoy in your curries. Carrots, green beans and potatoes all work nicely (cook the potatoes a bit in advance). 1. Add the vegetable oil in the pan then heat to medium heat. Add the green curry paste and heat until it brings out a good aroma. 2. Add the sliced chicken (note: let it get a good sear before moving on), and add the coconut milk a little at a time. Add crispy eggplant and small eggplant. 4. Serve with steamed rice. 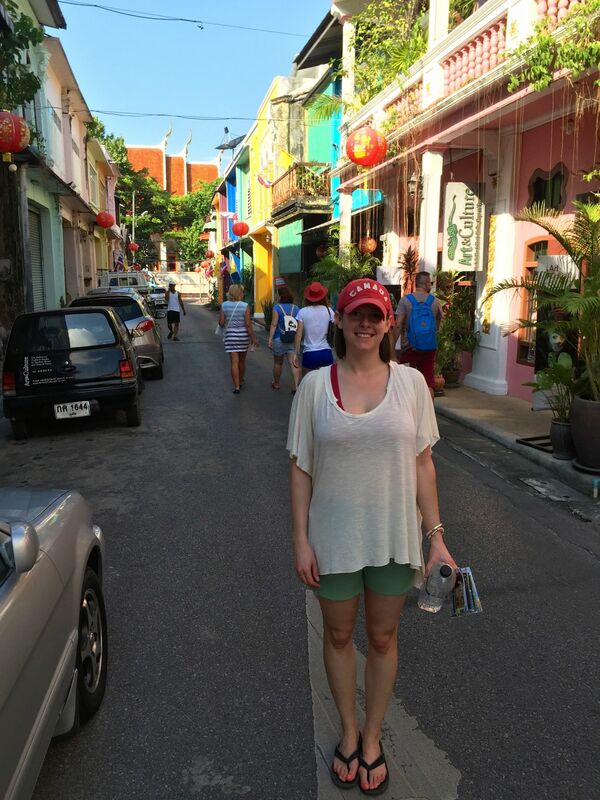 A few days ago I returned from an unbelievable, dreamy two-week trip to Thailand, where I celebrated my 30th birthday. We booked this adventure last August, giving ourselves lots of time to plan fun excursions (Thai cooking class, speedboat tour, etc) and make suitable birthday plans. Here, I will chronicle my out-of-the-ordinary birthday in Phuket, Thailand (usually I’m snowed in somewhere in Halifax drinking copious amounts of wine and enjoying a cheese-heavy meal with loved ones), focusing mainly on the food. Fresh mango on our terrace. The day began with freshly cut mango, which we had purchased from one of the nearby fresh fruit stores in Kata Beach. 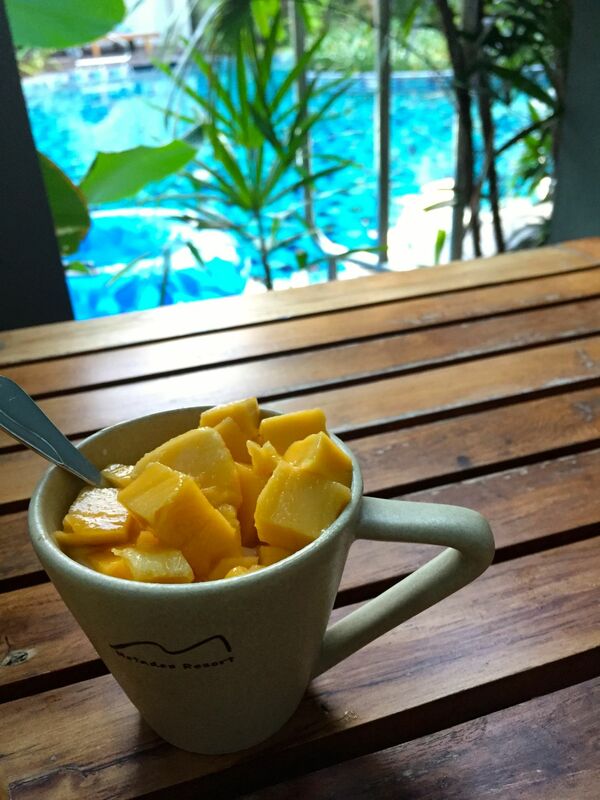 We were staying at the charming Metadee Resort, in a deluxe pool access room, so I enjoyed my cup of mango and yogurt on our terrace by the pool, then jumped in for a dip. The temperature by this time, in the early morning (the cooler part of the daytime), was about 27º or 28º C.
A big part of the day involved a spur-of-the-moment bus trip to Phuket Town from the area we were staying in, Kata Beach. After splurging on a European breakfast at The Viking Restaurant (owned by Danes), we hailed the bus. There seemed to be a few types of public buses in Phuket, the long blue bus being more touristy, making less stops, and going from each major town to the next (although they’ll stop any time you bang on the window), for only 35 Thai baht each, which is currently $1.35 CAD. With the hilly terrain, weak engine and semi-frequent stops of the open-air bus, it took us about an hour to travel to Phuket Town, which is actually only 10km away if you take a direct route. But, we got to see a lot of the island this way. A little sweaty and a little tired, in Old Phuket Town. Once arriving in Phuket Town, which is the largest town on the island of Phuket (which is the busiest tourist destination in Thailand), we didn’t really know where we were going or what we were looking for. Phuket Town has a population of over 91,000 people and I have to say it was bigger than I had anticipated. I had heard tell of an “Old Town” section being charming and historic and whatnot. After walking aimlessly (in the wrong direction) for about 25 minutes, we stopped at Kaffe, an air-conditioned, hipster-looking coffee shop, where I refuelled with a creamy egg sandwich on beautiful bahn mi style bread and an iced coffee. We connected to the wifi and made some more solid plans. We got the direction to Old Phuket Town down, partly on our own and partly from advice of one of the many taxi drivers trying to sell us a tour. He told us the beautiful buildings that the tourists like to see were on two specific streets, so we headed in that direction on foot. (Ah, traveling.) This was all on a sweltering (to us) 32º C full-sun, 90% humidity kind of day, (that’s pretty much every day there) so we were drinking LOTS of water and reapplying sunscreen like crazy. Once returning to our resort, we of course had a well-deserved dip in the pool, showered and got ready for dinner. I had made a reservation a month prior at a picturesque and popular Thai restaurant called On the Rock, housed at the Marina Phuket Resort, directly on the water. The service at On the Rock was unmatched by anything else we experienced in Phuket, the price point, for Thailand, was high and it was clear they catered to many tourists. We started with some prosecco, to celebrate, then I picked out my very own fresh red snapper, which was on display with the other fresh seafood for the day as you enter the restaurant (this is customary here). For first course, I had my first tom sum, a spicy green papaya salad with green beans, almost the style of a slaw, with a very flavourful dressing of chiles and garlic, fish sauce, and some sweetness. This was delicious, and not to be my last on the trip. Geir had tom kha gai which is a mild coconut-based chicken soup with great flavours of kaffir lime leaves and ginger, a very common Thai soup. 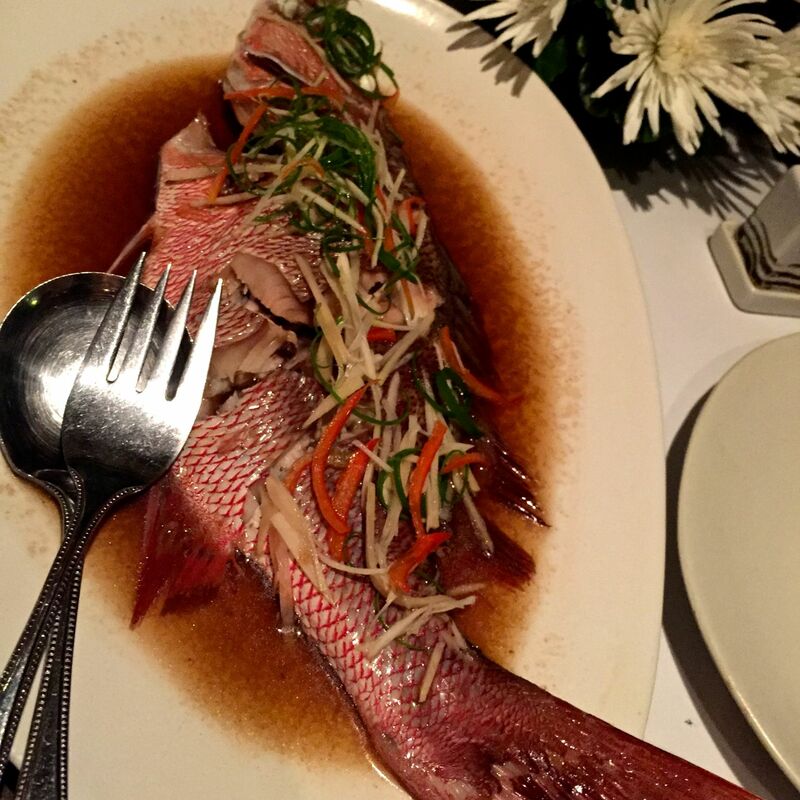 The red snapper was prepared nicely on the barbecue and was served with thinly sliced peppers, ginger and chiles on top. I enjoyed this super fresh fish with some classic steamed rice. Geir had a duck with mango sauce. They played happy birthday for me, and presented me with a fresh cut fruit plate with candles to blow out. The sun had set over the ocean during first course, and we went for a walk on the beach after dinner. My second birthday ever to be spent in a hot climate, with beach time (my 24th birthday was in Bondi Beach, Australia). On the walk home, we saw an elephant! The only elephant of the trip, as I’m not into exploitative animal-based tourism. I’m not sure whose elephant it was, or how they treated it. I didn’t give them any money but snapped a photo. This was a very small elephant. Euro breakfast at the Viking. Creamy egg on airy bahn mi like bread. Awesome iced coffee at Kaffe. Our amazing iced coffee place. A charming street in Old Phuket Town. Many places claimed to have Canadian or Maine lobster. The rest of the snapper! An elephant we saw on the walk home. The cheese gods continued to smile on me (thank you) last week, when another recipe drop from DFC (Dairy Farmers of Canada) arrived on my doorstep, by the lovely food photographer Beth Dunham, no less. I was told in advance what the recipe would be this time, and was provided with the link to check it out. 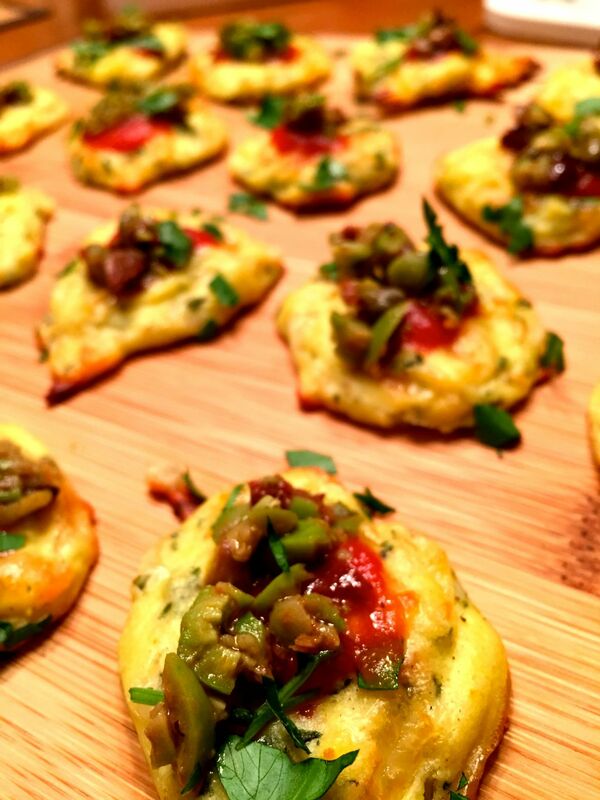 Thankfully, it was for a savoury appetizer (we remember what happened last time with the baking incident), called Mediterranean Ricotta Fritters. The recipe looked ridiculously simple… maybe even fool proof, but it still required baking something in the oven, which can be hit or miss with me. I prefer to take many liberties while cooking… throwing in ingredients here and there, or changing things up. Baking doesn’t lend well to that. 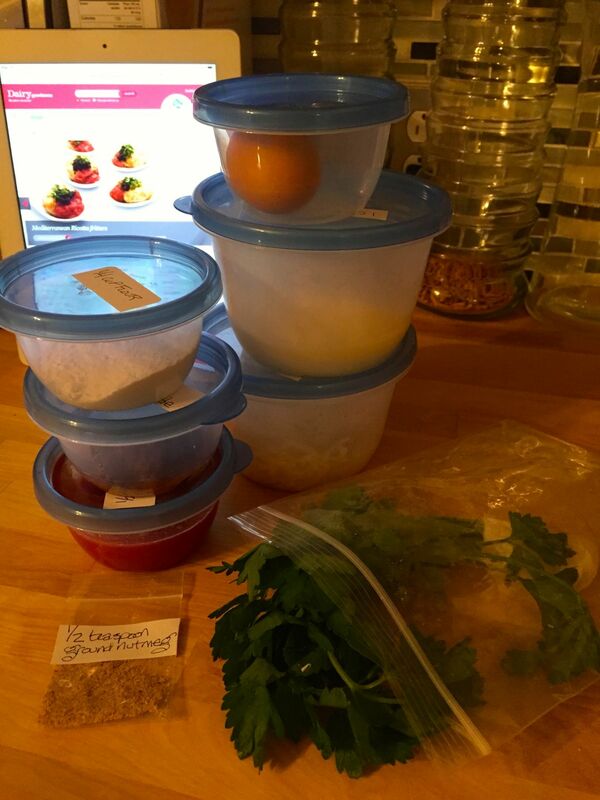 Everything needed for the recipe is pre-measured and dropped off. The first change I made was that, instead of adding just chopped herbs (parsley), I used the basil-arugula pesto that I had made a couple days before. This was incorporated into the batter. The batter recipe was so minimal, really just flour, an egg, ricotta cheese, Canadian Swiss cheese, a little bit of nutmeg, and salt and pepper. You then spoon tiny portions onto a baking sheet and just let them puff up until golden brown. I’m not sure if it was the additional ingredients in the pesto, but mine didn’t really puff up. They kind of did, then cooled flat. They tasted delicious, though, like a mini ricotta pancake. Fritters are normally deep-fried, so perhaps that would have helped. The two toppings — tomato sauce and black olive tapenade — were also provided. 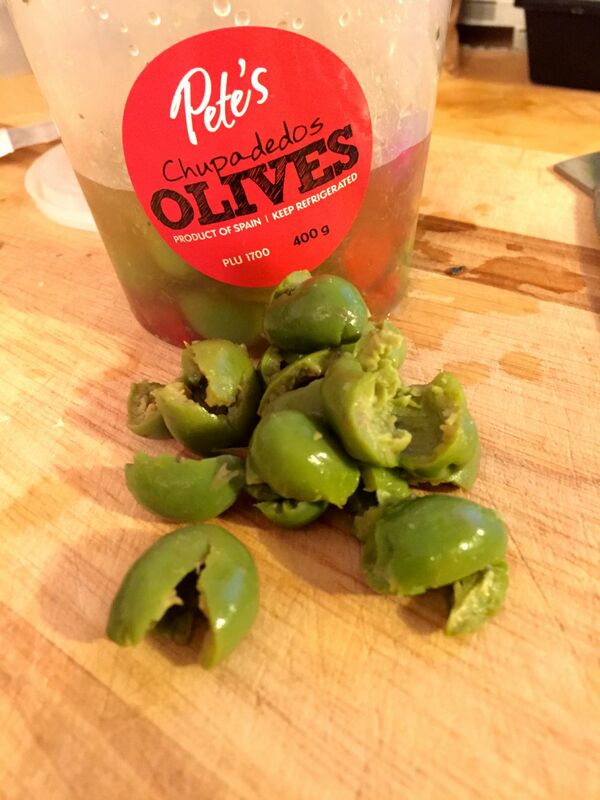 I livened up the tapenade by adding the life-changing olives we all know about from Pete’s, and a bit of roasted garlic oil. I did have the suggested serving utensil (wonton soup spoons) for a quick photo op, but in reality I took these with me on a board to serve at a potluck I was going to that evening. People liked them. They are now referred to as Festive Ricotta Fritters because of the green and red. They look kinda, sorta close to the photo on the Dairy Goodness recipe page… right? Watch the steps below. The recipe drop, from DFC. Incorporating Swiss cheese and pesto. Adding the best olives known to man, into the tapenade. As a pizza fanatic, I often have a jar of pesto on hand at all times. I prefer the crunchy, herby, garlicky base rather than traditional tomato sauce. I’ll admit, though, the pesto is not usually made by me, but by Riverview Herbs. Due to the abundance of beautiful herbs growing on my patio, I decided to make a batch myself. 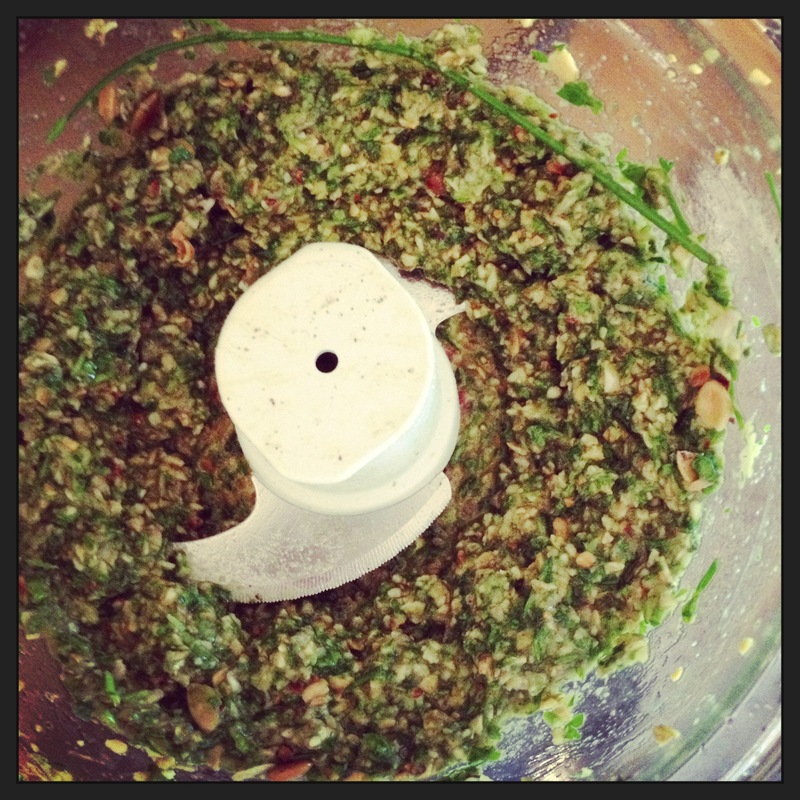 What I created was a deliciously fresh, earthy and (very) garlicky pesto, great for a variety of dishes. Obviously I used it on pizza, a couple times, but I wanted to branch out from that. Here are three other very easy-to-make dishes that incorporate pesto for an intense flavour boost, all day long. And no, I didn’t eat all three of these meals on the same day! Breakfast: I threw together a market veggie scramble with pesto and goat’s cheese; one of my favourite, quick meals for the morning when you want something healthy and substantial. How I did it: Heat the pan with a little olive oil, throw in some sliced onion, then chopped red pepper, asparagus, and a minute or two later, cherry tomatoes. Season. Allow them to cook about halfway. 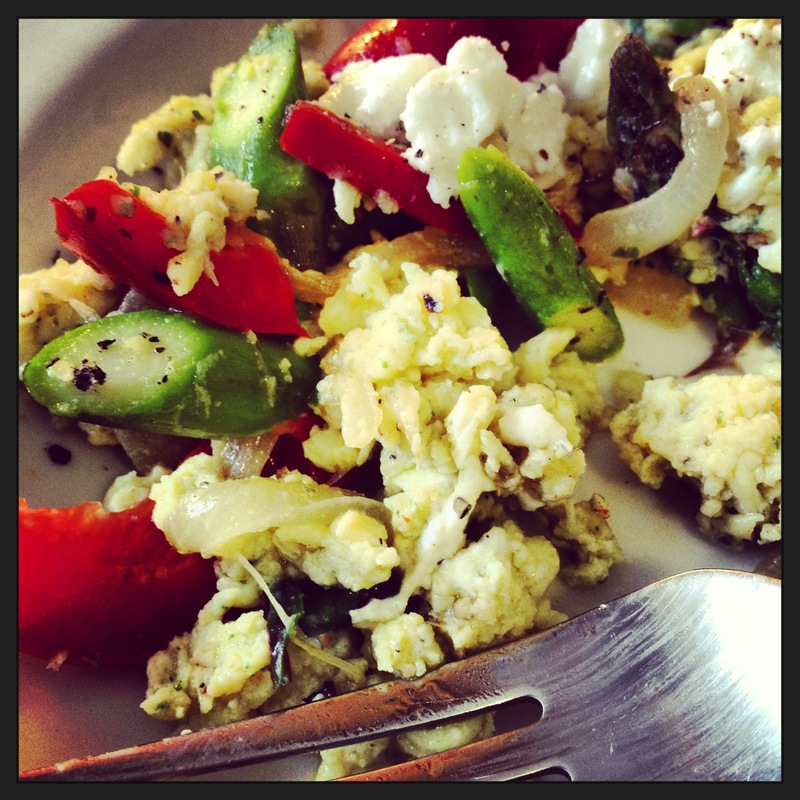 In a bowl, scramble your eggs with creamy Fox Hill milk, salt and pepper, then some pesto (a tablespoon or two). Pour in the pan and scramble away. Add swiss chard (spinach is good too) last and let it wilt. Dish into a bowl, adjust seasoning if you need to, and crumble Ran-Cher Acres goat’s cheese on top. 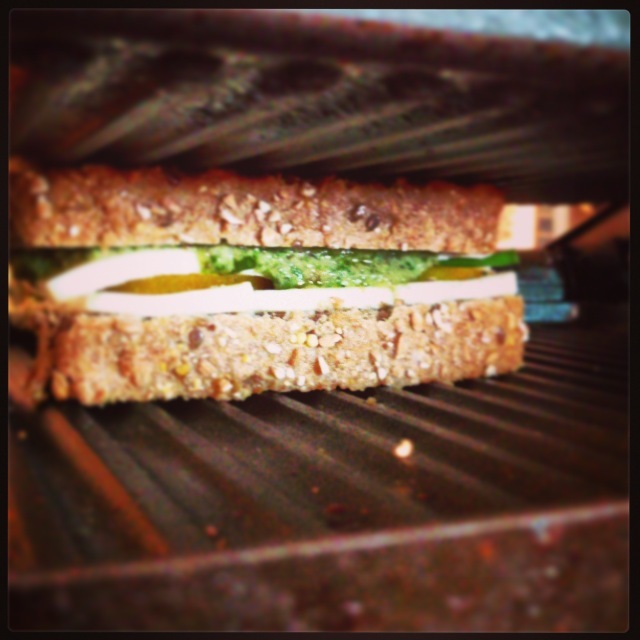 Lunch: Using my trusty panini press, I made pesto grilled cheese with sliced yellow tomato. If you’re making grilled cheese anyway, I definitely recommend adding some pesto in there. For this sandwich, I used Ran-Cher Acres goat paneer, which has a really unique texture. After buttering the bread (a really hearty multigrain loaf I buy at Local Source), I spread pesto thick on one side, layer both sides with sliced cheese, and put the tomato in the middle (or else it makes the bread soggy). Just remember that something needs to buffer the tomato’s moisture. 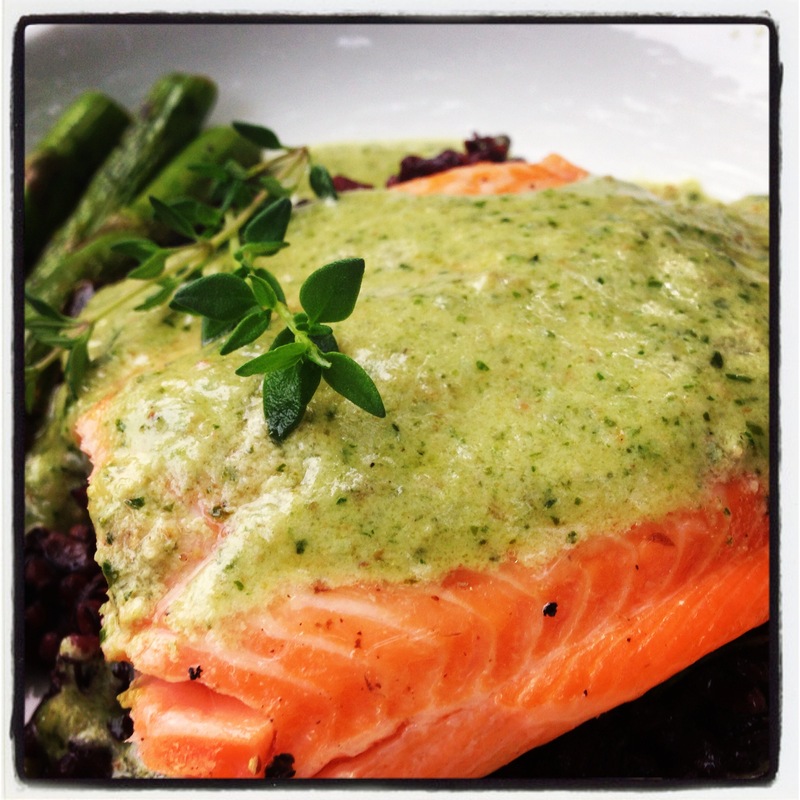 Dinner: Light up the barbecue for grilled trout with creamy pesto sauce, forbidden rice and asparagus. This was the perfect summer meal. And pretty healthy. I had the rice done in advance, as the black rice takes about 50 minutes to cook on the stovetop. How I did it: Everything on the barbecue. I reheated the rice in a little pot, just adding a touch of water, butter and some fresh thyme. For the fish, I oiled the skin side and grilled it skin-down, on medium-high heat for about 5-7 minutes. In a pan, I heated up some pesto with a tiny bit of butter, and simply whisked in creamy Fox Hill whole milk, until I had the consistency I wanted. I also grilled some asparagus. When it was time to plate, I used the rice as a base, topped with a piece of crispy-skinned trout, asparagus, doused everything in some freshly-squeezed lemon juice, and topped with the pesto sauce. The citrus really brings everything together as there are a lot of flavours competing in this dish, but it is lightened considerably and balanced by the lemon and works really well. If you’re wondering what I put in my initial pesto recipe, it was something like: Fresh parsley and chives (main ingredients), thyme, toasted pumpkin seeds (second main ingredient), Parmesan cheese, fresh garlic, roasted garlic, olive oil, meyer lemon infused olive oil, roasted garlic olive oil, fresh lemon juice, salt and pepper, and a touch of water. I finally got my hands on some sunchokes, a.k.a Jerusalem artichokes, the other week (from Local Source Market) and experimented with a few dishes. 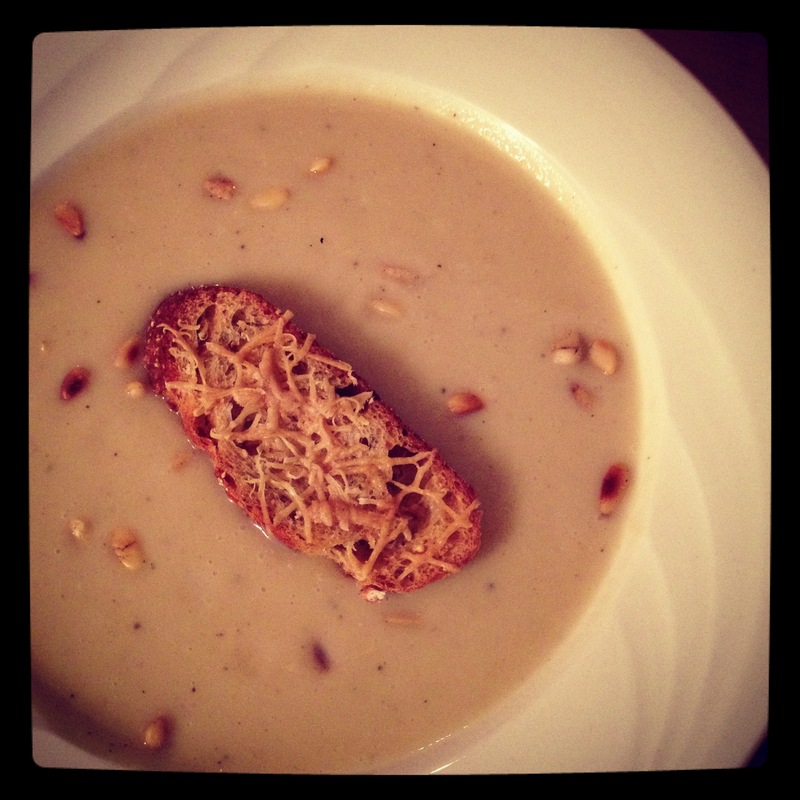 The best use of the ingredient, I found, was to make a creamy puree soup; this really showcased the sunchoke’s rich, unique flavour. It is a strange ingredient, I’ll admit. It looks kind of like ginger, but dark brown. It’s knobby and awkward to peel, but underneath the rough brown skin there is a bright pale flesh with a consistency somewhere between raw potato and a water chestnut. The process was pretty simple: first I sweated some onions, and garlic, in olive oil and a bit of butter. Once they were fragrant and had a bit of colour, I added my sliced sunchokes, and some small pieces of local golden beets that I had in the fridge. I seasoned them and let them sauté just for a moment before I covered everything in water and white wine to simmer for a while. In retrospect I should have just roasted the beets in advance because they took quite a while longer to soften up from the simmering than the sunchokes did. Somewhere along the way I added some freshly chopped basil, another splash of wine, more salt and pepper, and some lemon juice. Once everything was soft enough I used an immersion blender and blended everything in the pot until smooth. I let the soup mellow a while in the fridge and flavours really came together. Before serving I reheated on the stove, mixed in a tiny bit of heavy cream, sprinkled on some toasted pine nuts and topped with a Parmesan crostini. 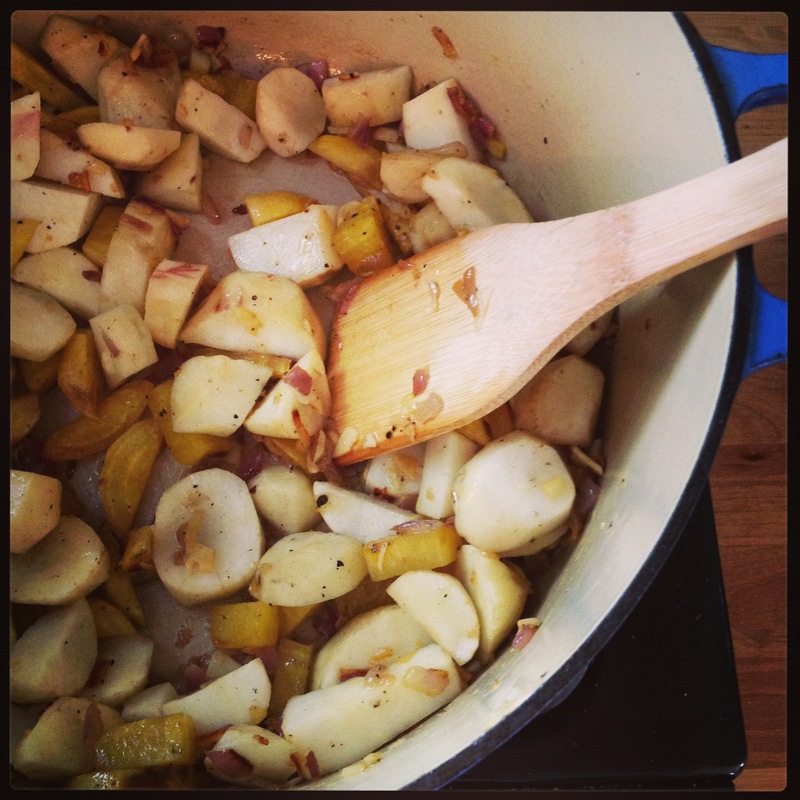 Sunchokes have a great flavour… they are rich, creamy, garlicky and substantial. 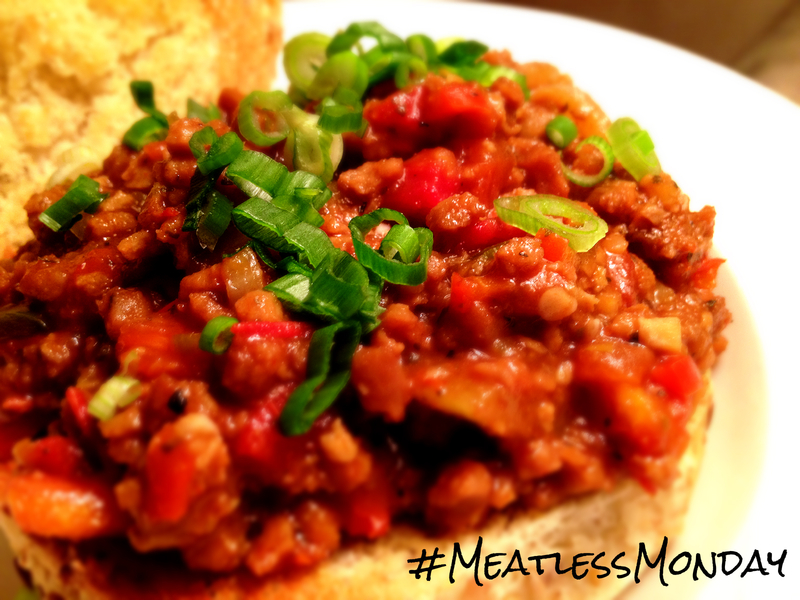 Definitely pick some up while they’re in season; they are versatile and delicious! Today is apparently Pi Day, which the foodies have turned into a day to post photos of pie-related dishes. Most memorable (so far) is this awesome creation by Ratinaud. 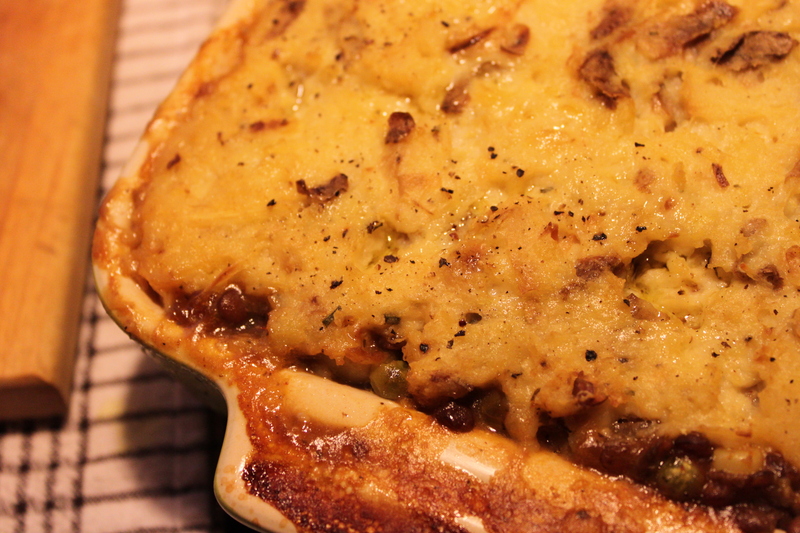 Lucky for me, I was already planning on blogging about my most recent dish, brown lentil shepherd’s pie. So what better day to post? I love making a dish that’s a meatless concept where you’re replacing the meat with something else, but the look of the dish is virtually the same, and the way you incorporate this other ingredient works so well that it’s a whole new thing entirely on its own. Know what I mean? Probably not, unless you’re a mostly-vegetarian eater like me. Brown lentil shepherd’s pie is DELICIOUS. 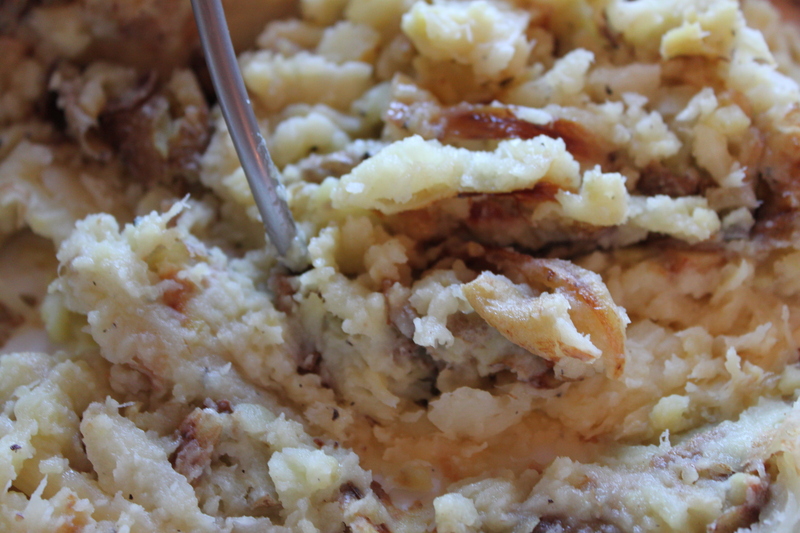 I’m not going to say “it tastes just like regular shepherd’s pie,” because that would be a lie. 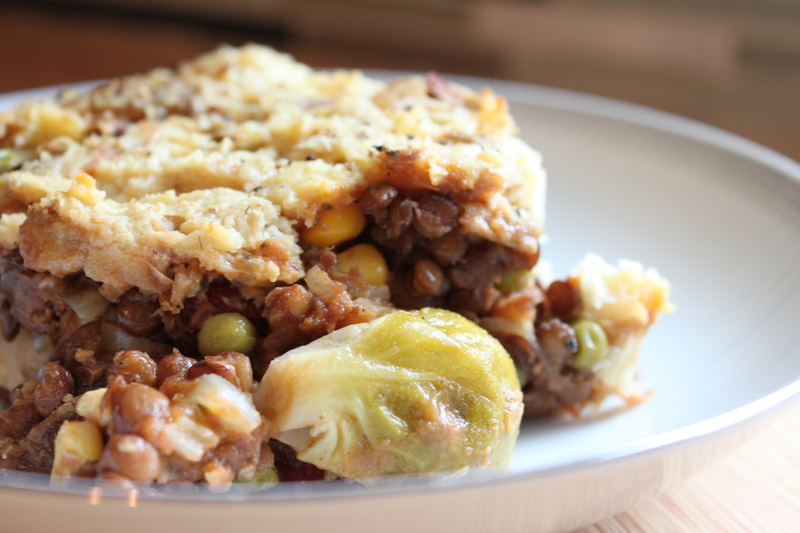 It tastes like lentil shepherd’s pie. And when you use the right vegetables, herbs and seasoning, you can get a fantastic texture and flavour. So much that you would look forward to eating lentil shepherd’s pie, and wouldn’t even think about the “regular” version, or to compare the two. Part of the deliciousness of my recipe was the mash. I oven roasted local fingerling potatoes and parsnips, kept the skins on, and added a splash of milk, along with Ran-Cher Acres chives goat cheese, and a bit of homemade roasted garlic oil. For the lentil layer, I started with dried brown lentils, and cooked them like the package directions told me to. I haven’t cooked with lentils much. This worked. Then I sautéed garlic, onions, and Brussels’ sprouts. 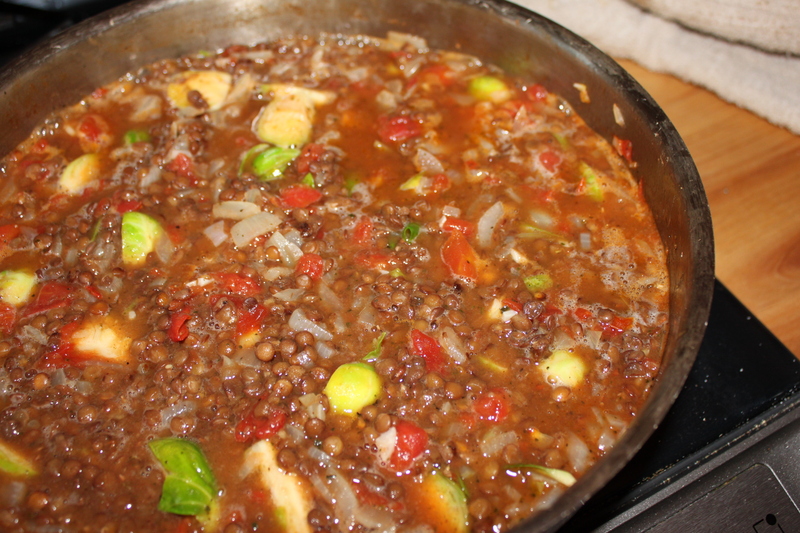 When those are looking good, you add some tomato (canned works), corn, peas, veggie stock, and throw the lentils back in to simmer. You could use different herbs here (rosemary would be nice), but I only had some basil, so that’s what went in. I also squeezed in a generous portion of Sriracha, because I knew we’d love a little zing to our lentil shepherd’s pie. I was right. Once this is reduced and thickened, seasoned to your taste, and the flavours have melded, you just spoon it into a baking dish, top with the mash, drizzle a little olive oil and bake it for 20-30 minutes, around 375, until the top is starting to turn golden brown. Yum. The the best decision I made with this dish was to use the Brussels’ sprouts, as they added a needed crunchy-firm aspect. The dish had a little heat, too, just the right amount. We both had seconds. One cool thing… if I hadn’t added the goat cheese and milk into the mash (you could sub out for almond or rice milk), this dish would have been vegan. And still hearty.